This article is about the 1988 film. For the 2017 remake, see Beaches (2017 film). 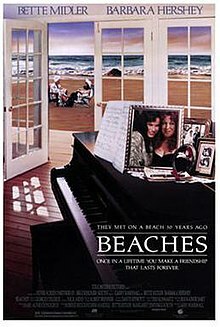 Beaches (also known as Forever Friends) is a 1988 American comedy-drama film adapted by Mary Agnes Donoghue from the Iris Rainer Dart novel of the same name. It was directed by Garry Marshall, and stars Bette Midler, Barbara Hershey, Mayim Bialik, John Heard, James Read, Spalding Gray, and Lainie Kazan. Despite generally negative reviews from critics, the film was a commercial success, grossing $59 million in the box office, and gained a cult following. A sequel, based on the novel Beaches II: I'll Be There was planned with Barbara Eden but never filmed. The film's theme song, "Wind Beneath My Wings", hit number one on the Billboard Hot 100 charts and won Grammy Awards for Record of the Year and Song of the Year in 1990. The film took in $5,160,258 during its opening weekend beginning January 21, 1989. It grossed $57,041,866 domestically. The film was released on VHS and laserdisc by Touchstone Home Video on August 23, 1989, with a DVD release on August 13, 2002, followed by a special-edition DVD on April 26, 2005. The film was later released in High Definition Blu-ray format on November 6, 2012. On review aggregator website Rotten Tomatoes, the film holds an approval rating of 38% based on 40 reviews, and an average rating of 4.4/10. Included on the soundtrack was Midler's performance of "Wind Beneath My Wings", which became an immediate smash hit. The song went on to win Grammys for Record of the Year and Song of the Year in 1990. It was nominated for the Academy Award for Best Art Direction (Albert Brenner and Garrett Lewis). ^ "Beaches (15)". British Board of Film Classification. March 13, 1989. Retrieved November 29, 2016. ^ "Beaches (1988)". The Wrap. Retrieved April 4, 2013. ^ "Beaches (1988)". Box Office Mojo. Retrieved April 29, 2013. ^ "Beaches (1988)". Rotten Tomatoes. Fandango Media. Retrieved March 22, 2018. ^ "The 61st Academy Awards (1989) Nominees and Winners". oscars.org. Archived from the original on July 6, 2011. Retrieved July 31, 2011. ^ "AFI's 100 Years...100 Songs" (PDF). American Film Institute. Retrieved July 30, 2016. ^ Andreeva, Nellie (July 28, 2016). "'Beaches' Movie Remake Starring Idina Menzel Greenlighted By Lifetime". Deadline Hollywood. Retrieved July 29, 2016. ^ Rice, Lynette (July 28, 2016). "Idina Menzel to play Bette Midler's 'Beaches' role for Lifetime". Entertainment Weekly. Retrieved September 25, 2016. ^ Gioia, Michael (August 25, 2016). "Will 'Beaches' Remake, Starring Idina Menzel, Include New Scenes?". Playbill. Retrieved September 25, 2016. ^ Jancelewicz, Chris (January 20, 2017). "'Beaches' Lifetime movie: 2017 remake puts new spin on old classic". Global News. Retrieved March 22, 2018. ^ Marzullo, Joseph (February 11, 2014). "PHOTO EXCLUSIVE: Alysha Umphress and Mara Davi Rehearse Signature Theatre's 'Beaches'". Playbill. Retrieved July 13, 2015. ^ Draut, Tiffany (March 4, 2014). "'Beaches' at Signature Theatre". DC Metro Theater Arts. Retrieved July 13, 2015. ^ Weiss, Hedy (July 3, 2015). "Test Of True Friendship Drives Emotional 'Beaches' Musical". Chicago Sun-Times. Archived from the original on July 9, 2015. Retrieved July 13, 2015. ^ Gioia, Michael (July 2, 2015). "Broadway-Bound 'Beaches', Starring Shoshana Bean and Whitney Bashor, Opens Tonight". Playbill. Retrieved July 13, 2015. This page was last edited on 4 April 2019, at 06:41 (UTC).